Taking a rest day is not in my vocabulary. But after two weeks without a break, Rich was ready for a day off the bikes. He approached the subject carefully, suggesting a two night stay in College Station. Little did he know that I had already been eyeing the George Bush Presidential Library there, eager to visit it. A deal was struck. We were both happy. Our timing proved to be unique. With Barbara Bush’s death just the day before, there was heightened interest in the library. Already the media was swarming the place, and preparations were in process for her burial there later in the week. Admission fees were waived, and ample volunteer guides were on hand to steer us through the exhibits and add personal notes of interest. This was my first visit to a Presidential Library, but I already know it won’t be my last. I found the whole experience fascinating. I expected the exhibit to chronicle Bush’s years as President. What I didn’t realize was that it actually encompassed his entire life. It was a complete picture of the man, his background, his wife Barbara, his family, his career and his life principles. By the time I finished, I had gained a deep respect for both George and Barbara as role models as well as our country’s leaders. I realized how little I really knew about Bush. I discovered the breadth of experience he had amassed before becoming President, and how each position prior to that one contributed to his depth of expertise and knowledge for the job. I found repeated messages about how he treated everyone with respect and continually reached out to others personally, resulting in his powers of diplomacy. And woven through it all was his commitment to family. From his firstborn to the large family photos with at least a dozen grandchildren, his and Barbara’s involvement in their lives never wavered. Nor did their devotion to community service. Above all his bravery in World War II, his political accomplishments, and his stint as President, my biggest takeaway is the constant drive to serve others that he and Barbara embraced. I was impressed with the selection of themes for the numerous exhibits and the tasteful way they were presented. The numerous artifacts and photos wove a compelling story for each scenario. What I enjoyed most was that in addition to the informational write-ups, there were little “Did you know?” posts that delved into the thoughts, feelings and beliefs of George Bush and his family and compatriots. They contributed humanity and feelings to the exhibits. I had two favorite rooms. One was a replica of the Oval Office as it was in George Bush’s day. The docent pointed out that the desk was two sided. Best of all, they invited visitors to sit and pose in George’s chair. How could we could resist? Second was the office George Bush used at Camp David. George himself narrates the description of various items in the office, including as mundane an item as his coffee cup warmer. I was amazed to learn that he spent three weekends a month there. What a blessing it was, mot only to have a place to retreat but to have space for family to join them. Equally important, George made Camp David available to other staffers during the week when it was not in use. Once again, his humanity reigned. Exiting the building after spending over three hours there, it was impossible to miss the flags at half mast for Barbara. Just beyond, memorials we’re already being left for her. Not only flowers, but children’s books in honor of her untiring drive to improve literacy in our country. It was a very touching. A fitting closure for our unforgettable trip to the Library. I’ve traded tall pines for stately saguaro cacti. A frozen creek for dry riverbeds. Cross-country skis for my bike. Winter storm warnings and deep snow for sunshine that warms my bare limbs. A woodland park for a desert canyon. It’s this last trade-off that feels significant. We bought our lot across from Amity Creek for its proximity to nature, the convenience of the trails, the white noise of the waterfalls at night. Living next to Lester-Amity Park is a statement about who we are, and what we like to do. Seeking a mid-winter warm-up, Rich and I chose a condo on the outskirts of Tucson, nestled in the foothills of the Catalina Mountains. Within minutes of unloading the car, we set out exploring, and Sabino Canyon Recreation Area – just a mile away – quickly became our neighborhood park. The park has one 3.5 mile road that snakes up into the canyon. The road mostly winds uphill. There are undulations to provide a bit of climbing relief, but the pitch is reasonable – at least until the last half mile. It travels through dry mountainsides populated by the mighty saguaro, prickly pear, barrel and other abundant cacti. Mountains rise in every direction, rocky angled faces dotted with small bits of vegetation. From 9-5 daily, open air shuttles own the road, carting hikers to their trailheads or sightseers merely wanting an easy narrated tour. Pedestrians are allowed on the road, but bicycles are restricted to the park hours before 9 or after 5. It doesn’t take me long to discover that those are the prime hours anyway. The golden hours. Early mornings are my favorite for cycling or running the road. I have plenty of company, as a whole generation of gray haired hikers seems to be striding purposefully up and down each morning. It’s brisk out there, with temperatures registering in the 30s and the canyon still in the shade of the mountains until well into my workout. The sun gradually finds its way onto the hillsides, illuminating select bits of the landscape as it works its way above the opposite mountain range. Numerous stone bridges mark my progress. Having arrived in town following a 3-day rainy spell, the normally dry riverbed is still brimming with flowing water. As designed, the current flows right over the bridge surfaces, and I follow the example of the hikers who plow right on through. It’s a cold, wet sensation. Even on my bike, it’s deep enough to splash my feet. I save the afternoons for less strenuous pursuits. A hike on one of the many trails or a slow shorter bike ride up the road still gives me access to the day’s fading light. Proximity is everything. We’ve explored and enjoyed other parks and wilderness areas here, but this one easily keeps calling us back. It’s our own park away from home. This trip has been planned for months. But only in our heads. Suddenly, with just over a month to go, the need to make firm reservations reached a critical level of urgency. In a frenzy of keystrokes, battling it out on two computers and independent cell phones, we chipped away at the myriad transportation pieces required to make this journey possible. Stymied time and again over clashing train and ferry schedules, long stretches of road with no services and sold-out lodgings, our itinerary morphed continuously. Punctuated by wails of despair, sighs of relief and begrudging compromises we persisted. Three ferry rides, one train trip and essential lodging bookings later, we had it. The Yellowhead Tour is now viable and official. The location is British Columbia, chosen to piggyback on a July family vacation on the Olympic Peninsula in Washington state. 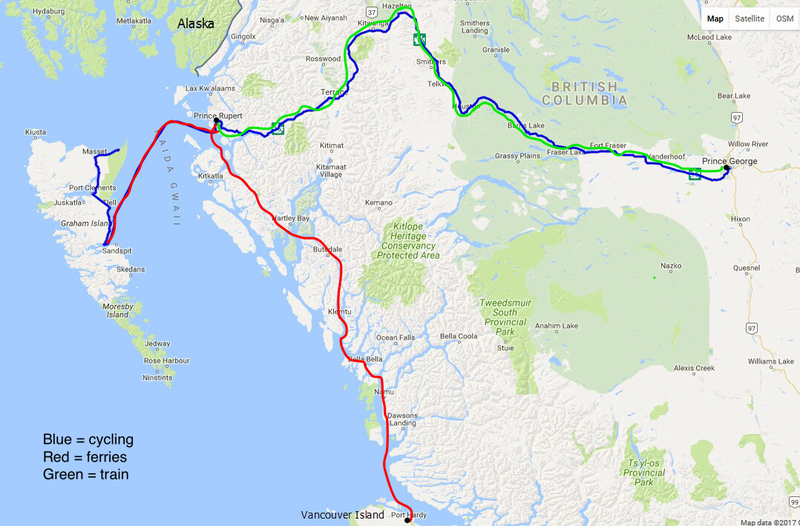 The general plan: cycle the Yellowhead Highway from Prince George to Prince Rupert, then ferry over to Haida Gwaii to ride the highway to its terminus on the northern tip of Graham Island. A total of 620 miles on the bikes over 17 days. But it’s a lot more complicated than that. We start at the tip of Vancouver Island, with an 18 hour ferry ride through the inland passage on the coast of British Columbia. That takes us within 15 miles of Alaska. It’s a highly scenic route through the calm waters of the coastal islands on a ferry that approaches the comfort of a modest cruise ship. A quick overnight in Prince Rupert, then we board Canada’s Via Rail for a full day’s journey to Prince George. It promises an eyeful of wilderness viewing. That rail segment is equipped with box car racks for our bicycles with roll-on, roll-off convenience – a cyclist’s delight. The next morning, we will turn around and repeat that same route via bicycle on the Yellowhead Highway. This time it will take us 12 days. Our trip originally ended there. But while scanning Google Maps, I happened to notice that oddly enough, the Yellowhead Highway continued west into the water. Huh? The dotted line took me to Haida Gwaii, a group of islands well off the coast formerly known as the Queen Charlotte Islands. Its current name literally means “island of the people” and it has a vibrant First Nation culture. It seemed an intriguing addition. We will cycle the final stretch of the Yellowhead Highway to the northern coast, then return to Prince Rupert once again. Traveling in peak tourist season is something we normally avoid. But given this northerly route, it is the only reasonable timeframe. So rather than winging it from day to day, we are nailing down each and every night’s accommodation. Having already learned that services can be scarce, we will surrender our flexibility in favor of peace of mind. This is actually one of our shorter trips in terms of cycling. But to make it happen, we will cover 575 miles by ferry, 450 miles on the train and 4,200 miles in the car. It’s a good thing it all worked out. Our jerseys are already on order. At least we planned ahead for those.